Dr. Wydell Williams is originally from New Orleans, LA and went to medical school at Meharry Medical College in Nashville, TN. He remained at Meharry and completed his general surgery residency training. He continued his surgical training at City of Hope National Cancer Center as a surgical oncology fellow pursuing clinical and basic science research. After seven years at City of Hope, he moved to Las Vegas and joined Desert West Surgery. For twenty-one years he has been a member of the group practicing oncologic and general surgery. Dr. Williams is certified by the American Board of Surgery in general surgery. 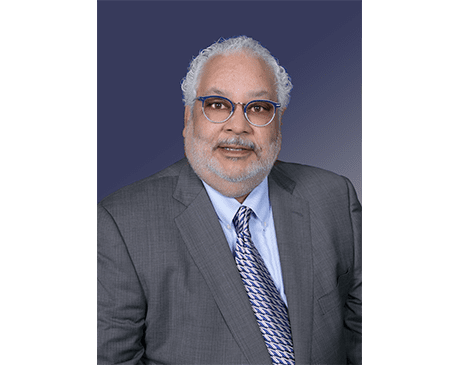 He holds academic appointments with University of Nevada Las Vegas School of Medicine and Touro School of Medicine and has been involved in the education of medical students and surgical residents for over 30 years. He has served on various committees at both the local and national level. He is also active member a several professional societies. In addition to his daily responsibilities he recently completed a master’s degree in Bioethics and Health Policy. Taking care of the surgical patient is paramount for Dr. Williams. This care is not only the time he spends operating but also making sure that his patients are educated about the disease process so that they can make informed decisions. Spending extra time before and after a patient’s surgery to make sure all questions and concerns are answered is important for him and he is willing to spend as much time is needed with his patients. Dr. Wydell Williams is committed to providing compassionate, innovative and trusted surgical care to his patient.